Whether you are working in a small business or large, analytics is the most important task for every organization. The same thing happens with email marketing campaigns. When you do email marketing for your business, then you would like to know what results are generating on your websites. How many visitors are arriving? For how long visitors are staying on your page? From what location they are reaching to your website? How many pages customers are viewing and much more. Along With Analytical Tracking Enabled On Your Site, Won’t You Go Carefree If You Get Inbuilt SMTP In A Single Email Marketing Service Bundle? Thinking how to track all such data for your website? 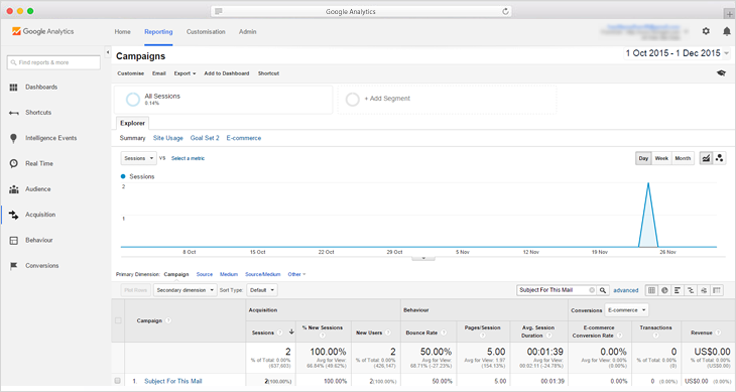 You can optimize your marketing efforts by integrating with Google Analytics and understand your campaign results in real time. So that you can measure all the performance of your website and know what changes you should make – to take your campaigns to the peak. Google Analytics lets you analyze the quantitative data of your email program and to monitor the entire journey of your customers. You can measure not only the performance of your site, but also take fresh insights into how customers use your website, from where they arrived, and how you can keep them engaging. Why Should You Integrate Google Analytics With MailGet? Get a detailed map/graph of your website traffic. Keep an eye on user behavior and traffic sources. Identify potential customers so that you can respond with information that pushes them closer towards buying a service or product. To track website statistics like – some visits, entrance and exit pages. To obtain the information about the user’s actions – Google Analytics is the best option for it! Analyzing the organic traffic is a key part of any email service provider and with Google Analytics, it is very easy to do. And know – what exactly your customers want from you. A session is the period of engagement of user on your website. One session is said to accomplish out when any visitor spent 30 seconds on the page. The more sessions you have -> the more traffic you generate -> the more chances of sales.. The number of visitors comes to your page and leave without interacting with another page of your website is bounce rate. Bounce rate of your website should always be low. The average number of pages that are viewed by any visitor during a session. The primary intention is to keep this metric as large as possible. The average time that any visitor spent on your page. This metric defines user engagement with your content, and it should always be high. Percentage of visitors who converts and make a purchase through your site. The total number of sales transaction performed on your website. Set goals from subscription forms to sales landing pages and track its completion. You can set as many goals as you want. Track total number of goals converted. Follow the type of Browser users are using Firefox, Safari, Google Chrome, Internet Explorer, etc. Know whether your website is responsive on various devices if not, track the number of bounce rate and improve your site design in that device. View email campaign report by Date and Hour. Get stats of different Operating System like Windows, Macintosh, Android, etc. Track your user’s City, Country, and Continent and know the region where traffic is more. Track the Type Of Device user is using like whether he is using a desktop, a mobile or a tablet. Deliver impressive content to the right audience by analyzing the results of your campaign through which you can work more efficiently. Track visitors behavior on your website and optimize your email marketing accordingly. Customize dashboard -> make reports according to your need as you wish to see -> check all stats anytime with updated reports. -> Evaluate your marketing strategies to get best outcomes for your business and optimize your campaigns in real time by integrating MailGet with Google Analytics.